You can now mine GlobalBoost-Y (BSTY) with AMD-based video cards thanks to a new fork of sgminer 5.1.0 from djm34 that adds support for Yescrypt (source) and we have compiled a windows binary that will allow you to try it out. The windows binary is compiled for x86, so it should work on wider range of systems using 32-bit or 64-bit Windows. Do note that Yescrypt GPU mining is still in early stage, so it might be a bit buggy initially and further optimizations in performance should be possible as this is a preliminary work to port the algorithm to GPU support. The coin does seem to handle well high intensity, so you should start low with 9 for example, also lower worker size such as 16 and 512 threads could be a good start. 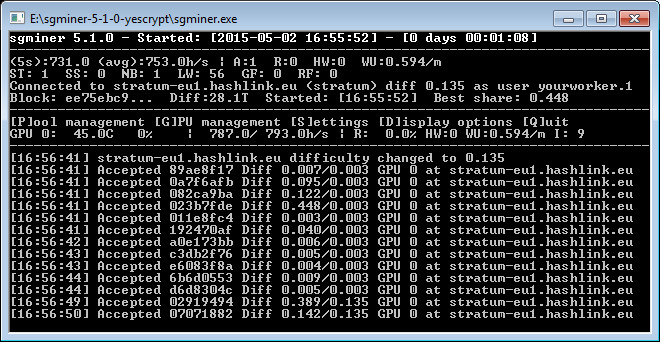 We are seeing a performance of about 700 hashes per second on a non-overclocked AMD Radeon R9 280X GPU with the settings above, but you are welcome to experiment. Do note that there is still more to be desired from the GPU miner as it is not faster than mining Yescrypt with an up to date CPU, for example a single Intel Core i7 5820K CPU achieves around 5.1 KHS mining GlobalBoost-Y (BSTY). Update: There is now a slightly faster yescrypt kernel available that allows you to get some extra speed, we got to almost 800 Hashes per second with it, you can download the updated version from the link below. Also the latest version includes yescrypt-multi algorithm for Nvidia Maxwell GPUs (Compute 5.0 or newer) that may provide faster performance than the ccMiner release according to the author, though in our case ccMiner was still faster.